The Basin Trail is located in the Uncompahgre National Forest near Grand Junction, Colorado. 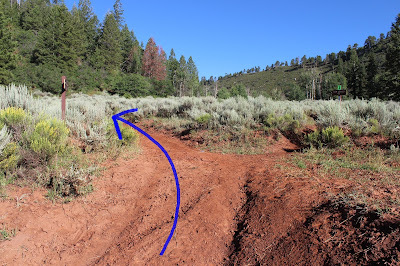 The trail stretches for just over 5 miles between the Big Creek Road and the Rim Trail. 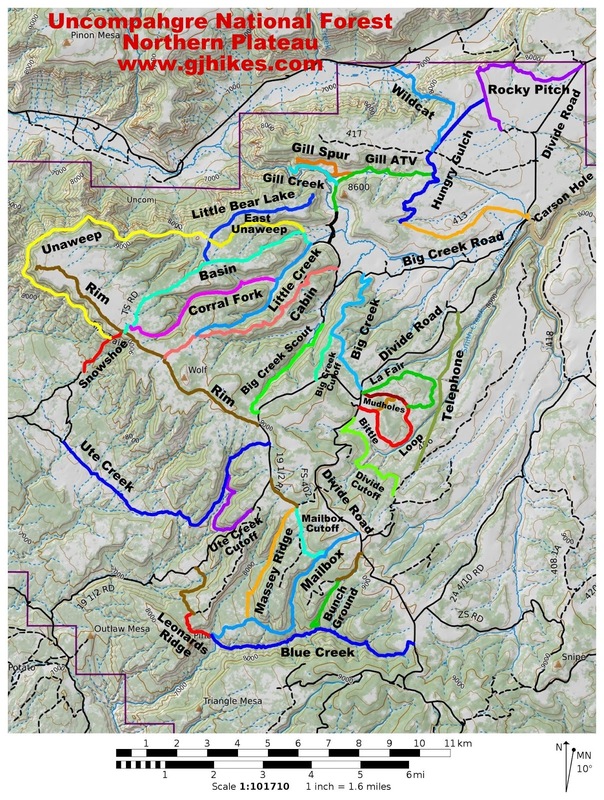 The Basin trail also provides access to the East Unaweep, Little Bear Lake, Middle Fork Bear Canyon and the Corral Gulch trails. The Basin trail is often combined with neighboring trails to form loops for longer excursions. While the trail is normally used only minimally it is enjoyed by equestrians, mountain bikers and off road enthusiasts of all kinds. The Basin and Little Creek trails share the same trailhead. To get there take Highway 141 towards Gateway to the Divide Road. Follow the Divide Road for 6 miles to the northern boundary of the Uncompahgre National Forest. 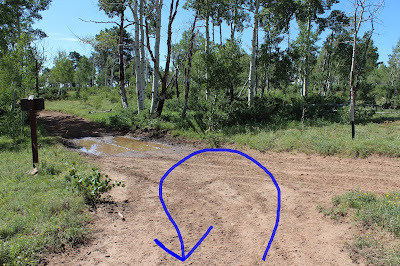 Continue for about 3.5 miles on the Divide Road until you come to a fork in the road. Take the right fork, which is the Big Creek Road, and measure about 5.8 miles to the trailhead. You will pass the Big Creek Cabin about a mile before you get there. 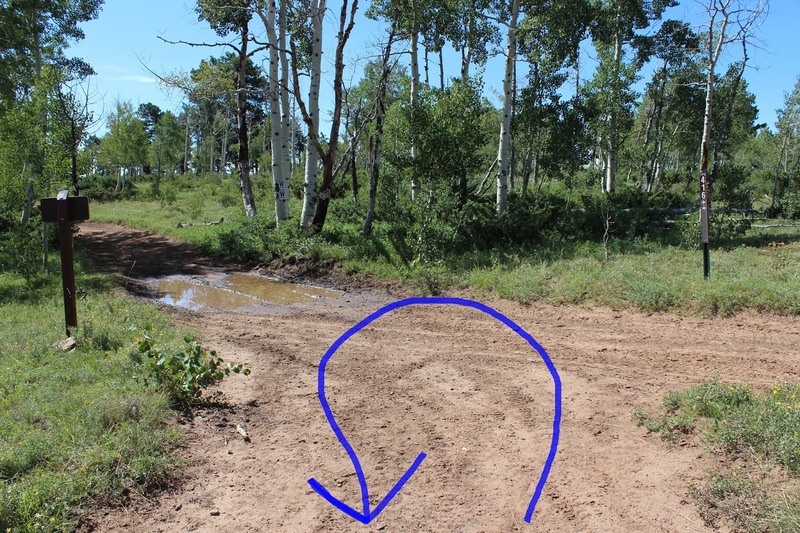 Sections of the Big Creek Road can get pretty muddy after a big rain so if the weather has been wet come prepared with another hike in mind as a backup. Trails that begin from the the Divide Road, like the Rocky Pitch, Bittle Loop and Divide Forks Cutoff trails, are good alternatives. The trail starts out a little steep for a very short distance and then becomes more moderate as it heads away from the trailhead. After passing through a gate at 0.2 miles the trail turns left at its junction with the East Unaweep trail. The trail has already gained about 100 feet of elevation at this point. Over the next mile the trail gains another 500 feet of elevation as it heads up the draw. A few sections of the trail are a little steep but stick with it because once it levels off it becomes an easy and very pleasant stroll. If you happen to be hiking the trail in August you can keep up your nourishment snacking on raspberries as you hike. There are numerous plants on the south side of the trail for the first half mile past the East Unaweep junction. Most of the plants are hard to get to so it would be difficult to pick enough to take home. The trail continues climbing after the first half mile past the East Unaweep junction but the slope is moderate in comparison for the next half mile. When the trail levels off it becomes a real treat to hike. There are a couple more little hills but they are shorter and easier. The Little Bear Lake trail branches off on the right at about 2.6 miles. If you keep your eyes out you should be able to catch glimpses of wildlife off in the trees. This little buck wasn't much interested in moving but after a few pictures the jitters got the best of him. The Middle Fork Bear Canyon trail comes up on the right after about 4.26 miles. And the Corral Gulch trail joins in on the left at 5 miles. The Corral Gulch trail has been just over the rim on the south side of the trail for most of the last 4 miles. 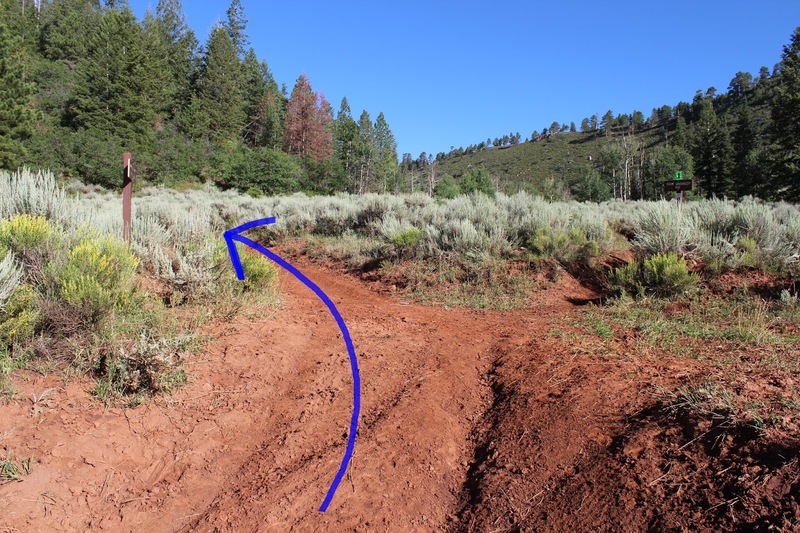 The Forest Services website has the Basin Trail being 5 miles one-way but it is actually another 3 tenths of a mile before you get to the Rim Trail where we turn around at. Being off by 0.3 miles probably doesn't matter much to anyone except hikers. Besides eating a few raspberries we also filled a couple bags with mushrooms. We filled one big bag with boletes and another with oyster mushrooms. Once the mushrooms start popping up you can be real picky about which ones you harvest and only take the very best home with you. The crummy ones don't look any better at home and will probably end up in the trash so no sense in even messing with them. All of the mushrooms that are too little will be just right if you come back the next weekend. You can also find giant puffballs and if you are real lucky some nice turkey tails. 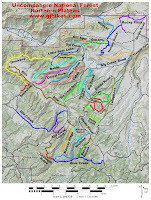 The Basin trail is an important trail in this area of the Uncompahgre National Forest. Mostly for all of the other trails that start off of it but also because it provides 4x4 access from the Big Creek Road to the Rim trail. Like any of the trails that begin off of the Big Creek Road you can look forward to about 900 to 1000 feet of elevation gain. For good exercise and beautiful scenery it can't get much better. And unlike most places on the Grand Mesa you don't have to worry about mosquitoes here. If you would like to see it for yourself then all you have to do is 'Take a hike'.